was proud to host Google's second annual EMEA (Europe, Middle East, and Africa regions) Faculty Summit last month. Eighty leading academics joined us from 66 universities in 24 countries for this three-day event. The Faculty Summit's purpose is to increase collaboration between key universities and our engineering teams. This year, we organised more than 40 talks and presentations, plus panels, networking and social events to help our guests learn more about Google's work in their regions. In return, Googlers gained valuable insight into challenges faced by the region's universities and new developments in the academic world. Event highlights included a keynote by leading cryptographer and Turing Award winner Adi Shamir on the topic of privacy and security as related to cloud computing. Further discussion centered on topics ranging from the power and limitations of cryptographic technology to usability issues introduced by security requirements, with some debate over the balance between preventing abuse and identifying and reporting abusers. Alfred Spector (VP of Research), Jeff Walz (University Relations) and I spoke about Google's engineering efforts and the impact of our university relations initiatives, with much discussion focusing on our involvement in the Arab and African regions. Rapidly expanding markets in the Middle East and Africa represent a major engineering challenge for us, and we are eager to continue collaboration with leading academic attendees from the region well beyond the Summit. We were pleased to welcome representatives from the Al Arabiya news channel, who highlighted this topic in a recent broadcast. We also heard from Google 'Research Award' and 'CS4HS' (Computer Science for High School) grant recipients and EMEA-based academics spending long-term sabbaticals at Google, who described their experiences over the past year. This year also saw new additions to the Faculty Summit agenda, including a networking session allowing academics to discuss collaboration options one-on-one with specific Google engineers. 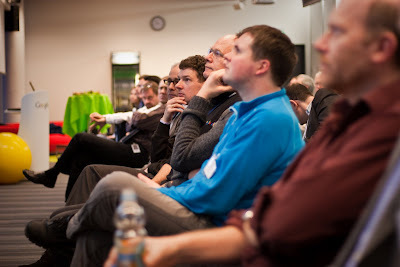 This session spurred a great deal of activity — for instance, multiple Googlers are booked to deliver guest lectures at external events and universities and several attendees have been invited to present their findings on research ranging from 'Software Visualisation' to 'Mobile Agile Testing' at Google engineering offices across EMEA. We plan to make these networking sessions a focal point at future Faculty Summits! I'd like to thank the organising team for their help in planning and executing this important event for the second year running. The 2009 EMEA Faculty Summit proved to be an incisive and informative event resulting in new academic and industrial collaborations. We look forward to reporting back on these synergies as they develop over the next year! Our Zurich office was proud to host Google's second annual EMEA (Europe, Middle East, and Africa regions) Faculty Summit last month. Eighty leading academics joined us from 66 universities in 24 countries for this three-day event.